1. Pinterest Place boards – now you can pin places (buildings, restaurants, landmarks etc) on to a map board. It’s really easy to use and looks great. Here’s an example. 2. Instagram DMs – you can now send a photo or video directly (and privately) to a friend on Instagram. Could this be a nifty way to build donor relations? Imagine getting a personalised Christmas card or fundraising ‘thank you’ from a charity you support? 3. 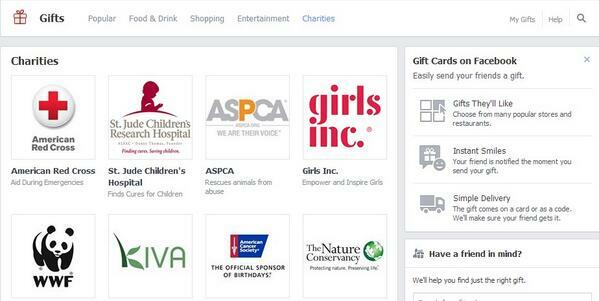 Facebook donate button – you can donate to charities on Facebook now (US only for the moment but expect to see it here mid 2014). This could have huge implications for charities but of course a Facebook Ads grant would have been much better… Read this article for more info on the matter. And you can sign a petition here to encourage Facebook to set up a non-profit Ads grant, much like Google’s Adword grants. 4. Google + custom URLs – now you can change your Google + page URL, which surely beats those random numbers right? You will need to meet three criteria to be eligible: You have to have a profile photo, at least 10 followers and an account which is over a month old. Google is rolling this out in stages but you will be informed when you are eligible to change your URL. Be warned… once you set your custom URL, you can’t change it (like Facebook Page names – and we all know how painful that is if you rebrand). 5. Twitter mobile gets a facelift – The Twitter mobile App has a new look. And it is sleek. ‘Connect’ is now called ‘notifications’ and ‘home’ is now called ‘timelines’. If you have different Twitter accounts you can now move more easily between the two timelines. Have you spotted any others? Share them in the comments field. 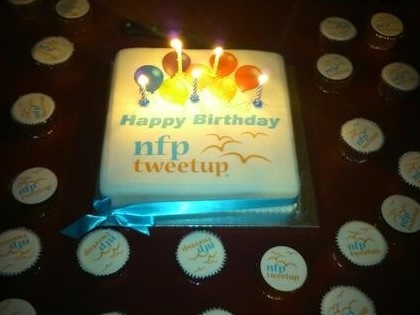 Last week NFPTweetup celebrated it’s 5th birthday with cake, cupcakes, wine and some great presentations and a panel discussion. The theme was on using digital in live events. Joe Dix, Website Manager at WWF was up first to talk about how they live-streamed Earth Hour. Next up was Digital Freelancer Bertie Bosredon to give us a glimpse into his digital toolbox. Finally, there was a panel discussion on using social media for live events with Sally Chambers from JustGiving, Kate Brennan from the BHF, Joe Freeman from Sue Ryder and Teri Doubtfire from Child’s i. But this isn’t a post about the event. This is a post about the phenomenon that is Rachel Beer. Rachel, and others (a dedicated team of volunteers), have worked tirelessly for five years to bring us NFPTweetup – a free event for digital people working in the charity sector to learn from our peers and to network. It started with humble beginnings back in 2008 in a pub with about 40 people and has grown to over 100, with tickets ‘selling out’ in minutes, and hosted in a proper auditorium (thanks to the generosity of Amnesty International). I can tell you, from running the Sole Communicators events with CharityComms, that it’s not easy running free events. It takes a lot of time to research new topics, source speakers, find free venues etc and then you have to hope that people actually turn up! It takes dedication and a commitment to ensuring that those working in our sector have access to the latest campaigns and trends. And all for free. It really is thanks to Rachel that I have met so many wonderful people and learnt from some of the best in our field.